Home Education What’s the “Big AHA” for the Future of Information Technology? What’s the “Big AHA” for the Future of Information Technology? Minneapolis, MN, September 19, 2018 – ​​Global futurist Jack Uldrich gave the opening keynote this morning at the Comm-Works 2018 Technology Symposium in Minneapolis. 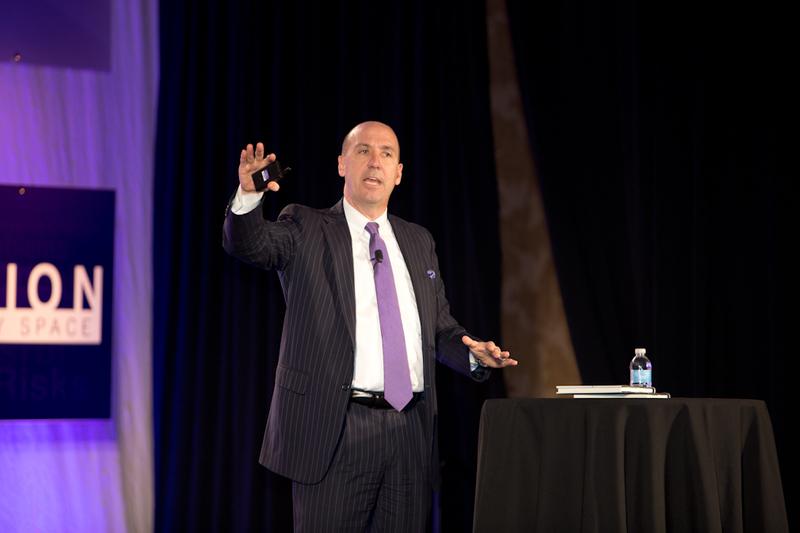 In his presentation, titled “The Big AHA – How to Embrace Today's Trends to Create Tomorrow's Opportunities,” he shared his insights on how leaders in information technology can survive and thrive in our fast-changing world. “AHA” is Uldrich's acronym for Awareness, Humility and Action which he says, “are the cornerstone of great leadership.” He also says the Big AHA is a “sure-fire way to brace your organization against the transformational trends of tomorrow, today.” He began his presentation by discussing trends IT leaders must be aware of and then he shared how these trends could transform everything from how employees do their work, to how companies provides their services to customers, clients and partners, to how they grow their businesses. The many trends and technologies that Uldrich believes will have a profound impact over the next decade include artificial intelligence, quantum computing, the internet of things, blockchain technology, the sharing economy, and rapidly advancing workforce automation platforms and tools. Uldrich continued by talking about how each change in business requires humility, the second step in the Big AHA. With the world changing as fast as it is, we can’t always rely on “instinct” or what has worked in the past. Uldrich then shared specific strategies for IT leaders to embrace humility when planning for the future. Uldrich concluded his presentation with concrete actions that those in the audience could take right away to create a successful tomorrow for themselves and their companies. It is not enough to deeply understand how one technology works. You have to understand how multiple technologies will converge to spin off to create new opportunities. The work I do is all about helping organizations prepare for the coming technological changes so that they can efficiently navigate and determine the course of their future. Uldrich is a frequent speaker on emerging technology, change management, and leadership, and has addressed numerous businesses, trade associations, and investment groups around the world, including IBM, Cisco, USAA, General Electric, Wipro, Verizon, General Mills, Pfizer, and the U.S. Chamber of Commerce. To learn more about Uldrich, watch his videos, read his blog, or check his speaking availability, please visit his site JackUldrich.com.